NEW YORK CITY, July 26, 2018 – GFNY Global Cycling Marathon Brand continues to grow with 17 world-class cycling events across the globe. 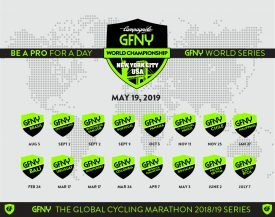 GFNY, the largest Cycling Marathon Brand features a total of 17 GFNY World races in the 2018/2019-calendar season. They include the Campagnolo GFNY World Championship in NYC and four regional championships in Asia, Europe, Latin America and the Middle East – Africa Championship. The GFNY season gets under way on August 5th in South America for notably one of the toughest courses at GFNY Brasil set in the heart of Colonial Charm of Conservatória. One month later, the first of two GFNY Super Sundays are hosted in Asia and Europe on September 2nd. GFNY Indonesia – GFNY Asia Championship takes athletes to Samosir Island in North Sumatra for a tour of the idyllic tropical island. GFNY then heads to Europe and Germany for the GFNY Deutschland – GFNY Championship Europe. GFNY Deutschland has become a celebrated staple on the GFNY calendar for the German festival beer garden atmosphere, beautiful countryside and a fully closed-to-traffic course. One week later on September 9th the highly anticipated inaugural GFNY Portugal takes place in the Portuguese Riviera of Cascais; arguably the best cycling destination in Portugal. The month of October sees GFNY head back to South America for the inaugural GFNY Panama on October 21st. Located in Playa Blanca away from the hustle of Panama City, visitors will be spoilt with the perfect combination of sport and leisure. GFNY Cozumel takes place on November 11th. It’s a ‘paradise perfect’ end-of-season challenge and warm-weather getaway – and a great GFNY party both on the bike and off the bike. On November 25th the second edition of GFNY Chile starts out from the renowned Veramonte winery and takes riders through vineyards and along the Pacific Ocean. The now world-famous Muro de Tunquen is the ultimate rider challenge with an incline over 25%. 2019 starts on January 27th in the Philippines with the inaugural GFNY Philippines. The perfect opportunity for a picture postcard cycling holiday escape, the host island of Bohol and the local Filipino excitement for cycling will provide the ultimate cycling experience. Staying in Asia, February 24th is GFNY Bali, set in Sanur, one of Bali’s oldest and most beautiful resort areas. Riders will take on a unique course up to the crater rim of one of Bali’s most famous volcano’s. On March 17th the second Super Sunday takes place starting with GFNY Monterrey. The race begins from the famous Cintermex, from there riders will race through the heart of Monterrey and finish in beautiful nature at the top of Chipinque Mountain. On the same day, GFNY Uruguay takes place in Punta Del Este, regarded as the Saint Tropez of South America. It is the country’s only mass participation bike race.